Vitamin D is not technically a vitamin. It is a steroid hormone intended to be absorbed primarily through sun exposure, not diet. There aren’t many foods that naturally contain therapeutic levels of vitamin D and even foods that are fortified with vitamin D, such as milk, do not contain it in high enough levels to support your health needs. The form of vitamin D found in foods is more difficult for your body to absorb. Vitamin D is best absorbed via sunlight. In today’s post-industrial economy, most people work indoors. This has led to an increase in vitamin D deficiency; it is a very common ailment in the US and sadly underdiagnosed. The following is a compilation of symptoms that might indicate a vitamin D deficiency. There is a reason that people tend to feel a little lackluster during those dark winter days. Serotonin is the brain hormone associated with mood elevation and it rises along with exposure to bright lights and falls when you experience a shortage of sunlight. Furthermore, according to a study in the British Journal of Psychiatry involving over 31,000 participants, people with low vitamin D levels in their blood were twice as likely to experience depression than those with higher levels. The hippocampus and other parts of your brain that help to regulate your mood contain vitamin D receptors. Researchers suggest that low levels of vitamin D may interfere with functionality in these areas of the brain. Doctors have been known to mistakenly diagnose patients who come in with aches and pains as having chronic fatigue syndrome or fibromyalgia. A chronic ache in your bones is a classic symptom of vitamin D deficiency osteomalacia. The deficiency can reduce calcium in the collagen matrix in your skeleton, leading to throbbing pain and aching bones. It might sound a little strange, but a sweaty head is a classic sign of vitamin D deficiency, and is usually one of the first symptoms to manifest. Pay particular attention to head sweating in newborns. Excessive sweating of the head in newborn babies might indicate neuromuscular irritability and is a common and early red flag for vitamin D deficiency. 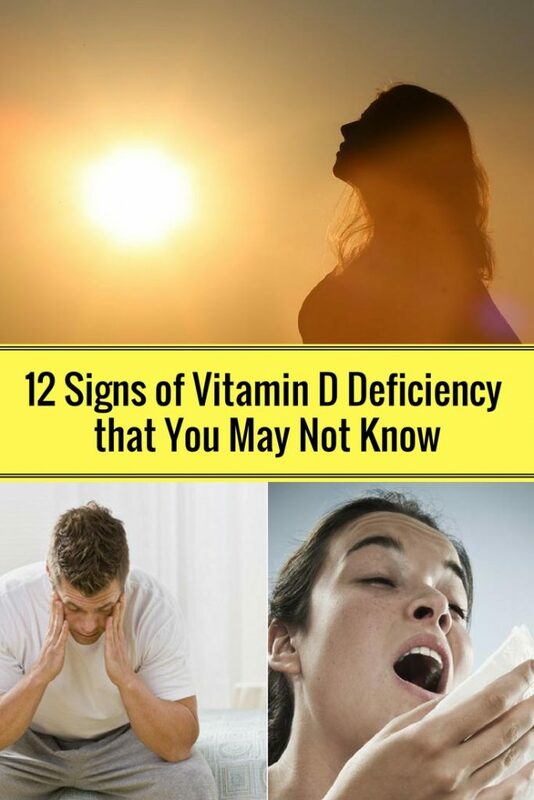 Check out page 2 for 9 more signs of vitamin d deficiency and 12 ways to make sure you get your recommended daily amount.